The Ypsilanti Parks and Recreation Commission's annual Fall River Day is this Sunday in Riverside Park and Frog Island Park. 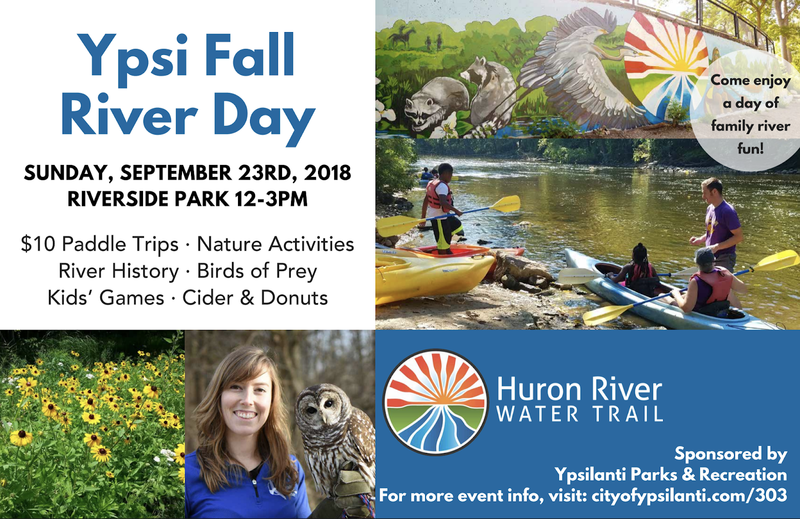 Full disclosure, I am on the Ypsilanti Parks and Recreation Commission, so this might just be shameless self-promotion. If you've never been, Fall River Day is awesome. Ann Arbor Parks and Rec will be bringing kayaks and you will be able to rent and launch them at Frog Island Park. If you don't have your own kayak or canoe, this will be one of the few chances you will have to paddle on this stretch of the Huron River. There will also be birds of prey, nature walks, games for kids, cider, and donuts. It looks like it'll be a beautiful fall day too, so you really have no excuse to miss it. Bonus: if you do come, make sure to stop by the kayak rental station where I will be helping launch boats.